(Top photo) Camera: Nikon D4 | Exposure: 1/640s | Aperture: F13 | ISO speed: 640 | Exposure mode: Manual | Lens: 24-70mm telephoto. 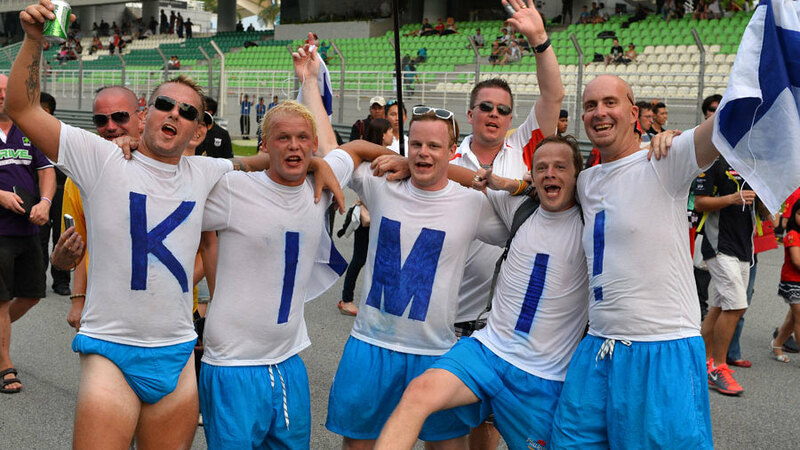 The Kimi Raikkonen fans are beyond belief in China. They paint their faces, wear wigs and print huge signs to support their man. Those main grandstand seats must be very expensive for someone on an average wage in China, but these guys and girls turn up every year dressed to support him – they are genuine fans. They created the finish flag out of all these little boards in the seats, so clearly they are also quite well organised, and as I walked past they were all saying “take our picture, take my picture!”. It’s absolutely amazing and I look forward to it now each year. Camera: Nikon D4 | Exposure: 1/1250s | Aperture: F7.1 | ISO speed: 1000 | Lens: 500mm Telephoto. I like this overhead shot of Nico Hulkenberg, the reason being is that it’s taken from an unusual angle. I’m actually nine floors up in the media centre shooting down over the track with my 500mm lens! The media centre is built into the bridge over the track and on each end there is a little gallery area. You can take photos of pit stops, podiums or this shot of the straight from there. Because it was wet and I was running a bit behind, I thought I’d do this shot from the window. But it’s slightly pot luck because I was actually stood on a chair to get the angle! You pre-focus on the track and as you hear the car coming past you just pap it on the motordrive. It shows the force of the spray coming out of the back of the car, but you have to wait for a car by itself because if there is one following another it leaves the spray in the air and the shot is not as clear. Camera: Nikon D4 | Exposure time: 1/500s | Aperture: F4 | ISO speed: 3200 | Lens: 500mm telephoto. 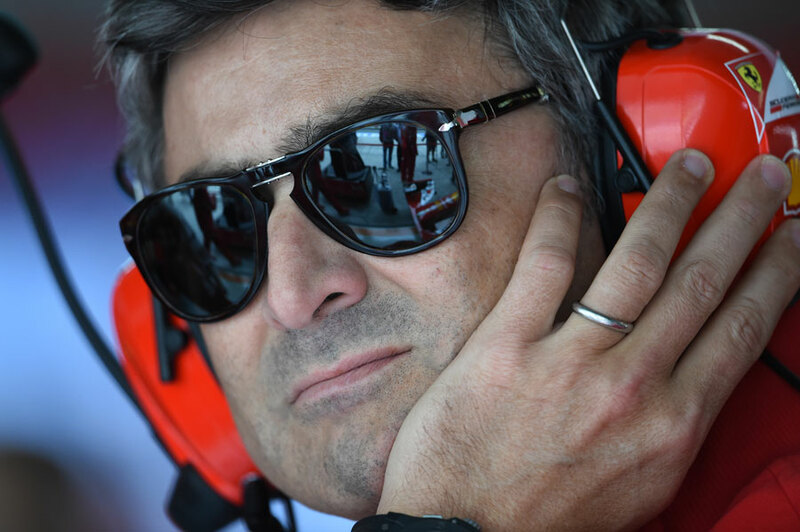 At first new Ferrari boss Marco Mattiacci was fine with the photographers, but after a while I think he got bored of us and started wandering off. He said he wore the sunglasses because he had done four flights in as many days without sleep. But I think it was because he didn’t want to show where he was watching in the garage. 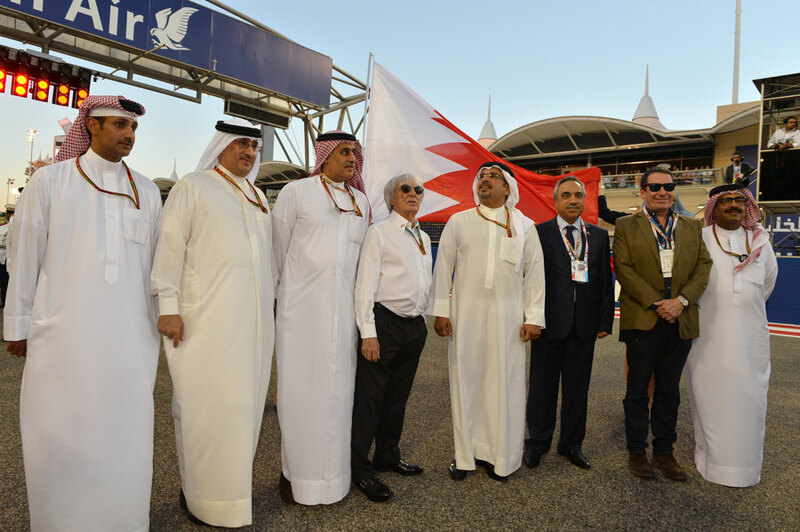 You can be quite discreet when you are wearing sunglasses, and I remember that being Flavio Briatore’s trick as no-one could see where he was looking! So it reminded me of another Italian. Camera model: Nikon D4 | Exposure time: 1/1250s | Aperture: F5.6 | ISO speed: 400 | Lens: 500mm telephoto. This photo was taken while Sebastian Vettel was still leading Daniel Ricciardo, and Ricciardo had two or three goes at overtaking his team-mate into the hairpin at Turn 14. 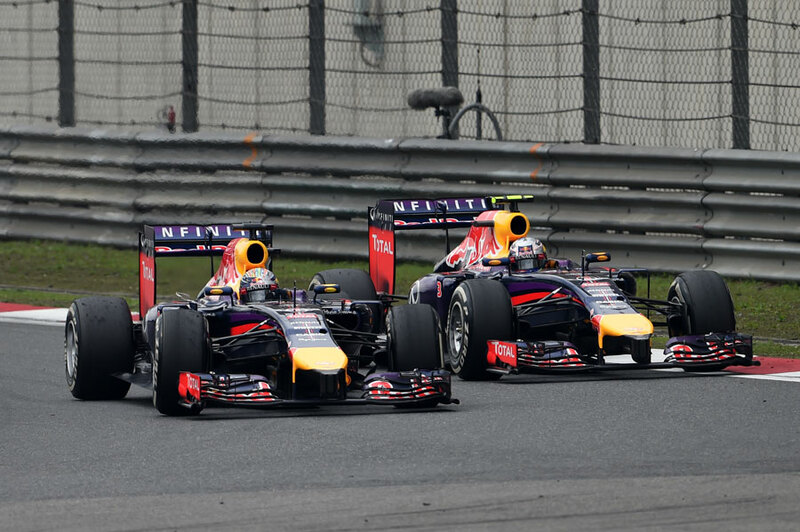 Vettel kept defending the inside and Ricciardo couldn’t get around the outside. You can see here that Seb is turning in already and Daniel is still straight, so perhaps he has locked up a bit. Obviously it all got a bit heated on the radio, but Ricciardo was much quicker and pulled away like you wouldn’t believe once he got past. Camera model: Nikon D4 | Exposure time: 1/800s | Aperture: F4.5 | ISO speed: 800 | Lens: 500mm telephoto. At the end of the race I took the usual finish shot as Lewis Hamilton crossed the line and then ran down the straight on the safe side of the barrier to get back to the pits. When they give you the okay you are allowed to cross the track to get back to the pit lane but by that time you’re too late to join the rest of the photographers shooting parc ferme head on. So I opted for this rear shot of Fernando Alonso and Lewis Hamilton as Fernando went up to him and patted him on the back and shook his hand. You’re always looking for those different angles during a weekend. I like this shot because Lewis Hamilton has just been hit in the back of the neck with the contents of a bottle of Mumm champagne and you can see the grimace on his face as it happens. 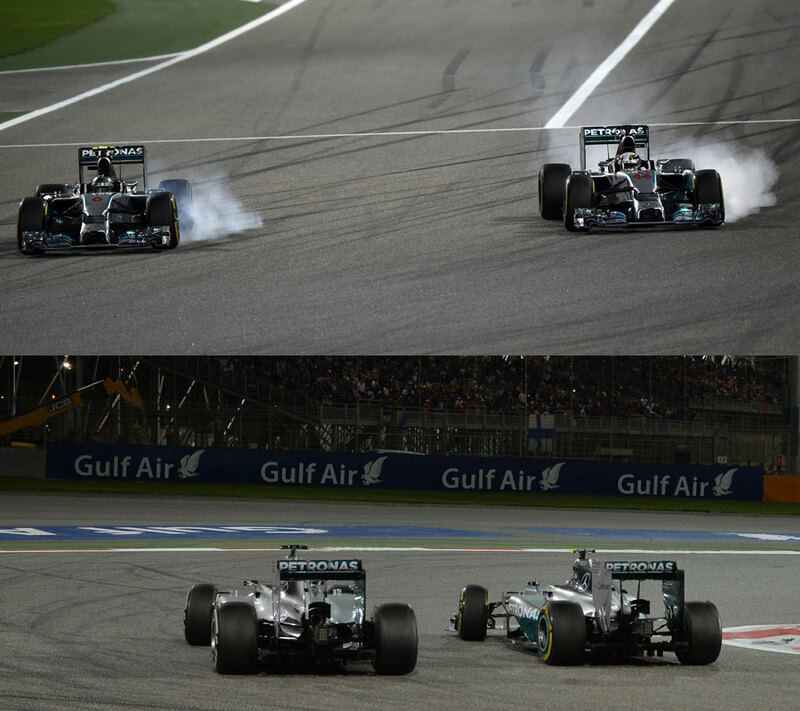 Lewis is obviously on a massive roll and has been given a big confidence boost from the recent races. He will pull ahead of Nico Rosberg in the drivers’ championship at the next race if he wins again, but I think it might be a bit closer between those two in Spain. Camera: Nikon D4 | Exposure: 1/1000s | Aperture: F4 | ISO speed: 2000 | Lens: 500mm Telephoto. The start of the race was quite spectacular and you can see Sergio Perez having a massive lock-up as he hits the brakes in the middle of the pack. The race started at 6pm so there was still a little bit of light in the sky and with the high ISO setting on the camera we are able to capture photos in low light. But actually at the first corner there are a lot of big lights and I would say it’s the best lit part of the track – it’s actually like daylight when you’re down there. Incredible. I stayed there for pretty much the whole race because there was so much action going on. But the start was pretty spectacular with plenty of side-by-side action and a good chance to get this photo. (Top image) Camera: Nikon D4 | Exposure: 1/800s | Aperture: F4 | ISO speed: 2000 | Exposure mode: Manual | Lens: 500mm telephoto. There was a good crowd on Sunday and they were enthralled by the action at Turn 1. You could hear them cheering over the sound of the engines at some points, which is something new for this year with the quieter cars. The battle between Lewis and Nico really got them going, with plenty of screaming and shouting as they battled into Turn 1. The head-on shot was taken from the photographers’ tower and there were plenty of opportunities for photos as they were battling so much throughout the race. The shot from the rear was taken from the turn-in point of the first corner and there is a little hole there in the fence that I’d never seen before. I stayed there until the very end of the race just in case anything happened. Camera: Nikon D4 | Exposure time: 1/1000s | Aperture: F4 | ISO speed: 2000 | Lens: 500mm telephoto. This was another shot from Turn 1 as Valtteri Bottas got late on the brakes and nearly went into the back of Kimi Raikkonen. How he avoided him I don’t know, because he got on the astroturf and there’s not much grip out there. He kept it out of the wall and continued round, but I was waiting for him to hit the barrier to be completely honest. There were full-on battles between several cars into that corner during the race and it was great to photograph. Camera model: Nikon D4 | Exposure time: 1/320s | Aperture: F11 | ISO speed: 1000 | Lens: 24-70mm zoom. 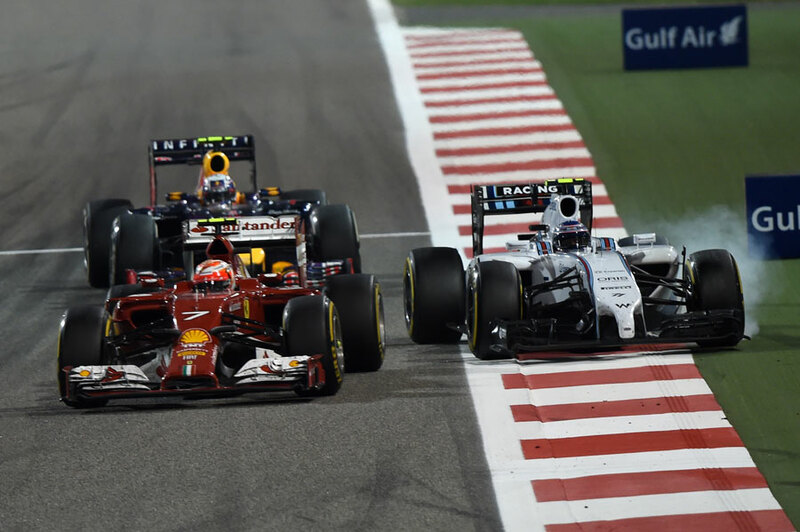 You have to congratulate the Bahrainis on what they did with the night race this year. 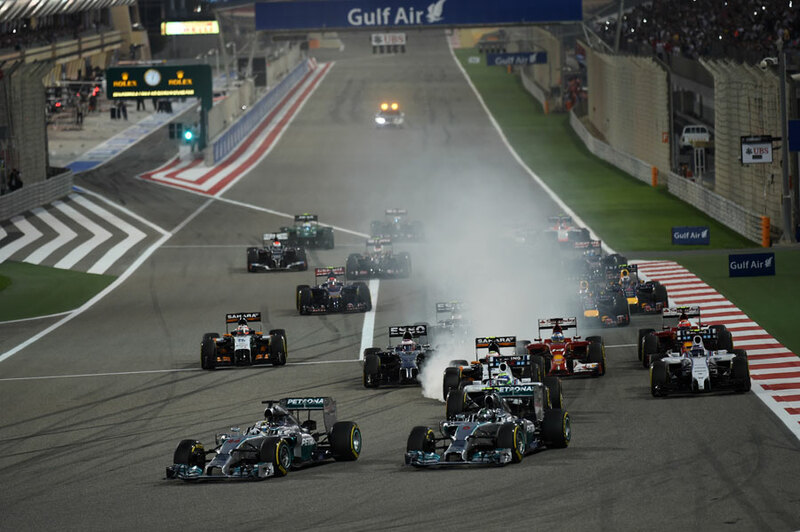 A lot of people dissed it and said Formula One didn’t need another night race, but obviously Bernie Ecclestone loves it because it increases the viewing audience on TV. They have invested a lot of money into this track over the last ten years and it’s a really good facility. What they did lighting the track, the palm trees, water pools and banking made it look fantastic. It really enhanced it and they also put on a good show for the paying public with side shows behind the grandstands and a music stage as well. People will come back next year because it was so exciting and it may be that we get a lot more exciting races here. I exchanged my position at Turn 1 with another of our photographers when the crash happened. That meant we still had a photo of the accident, but personally I only captured the aftermath. 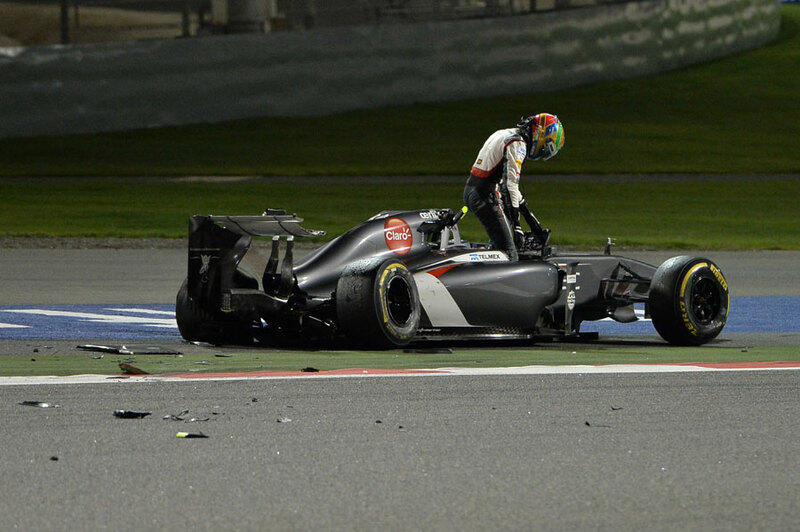 Fortunately Gutierrez was okay and able to get himself out of the car before the medical team showed up. He gave the thumbs up to the marshals while he was still sat in there to let them know he wasn’t too seriously injured, but he did walk quite gingerly back to the paddock and seemed to be struggling a little bit. 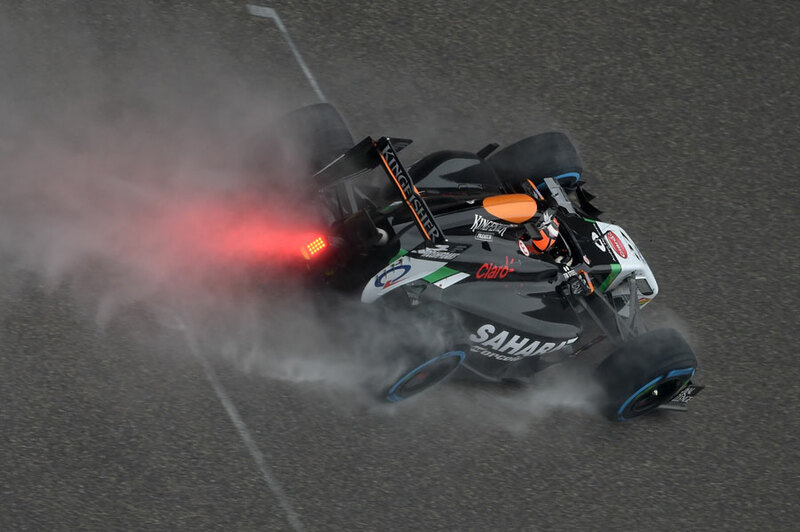 He’s fine now because he was back at the track on Tuesday during the test in Bahrain, but I think the chassis was totalled because it landed on the roll structure. 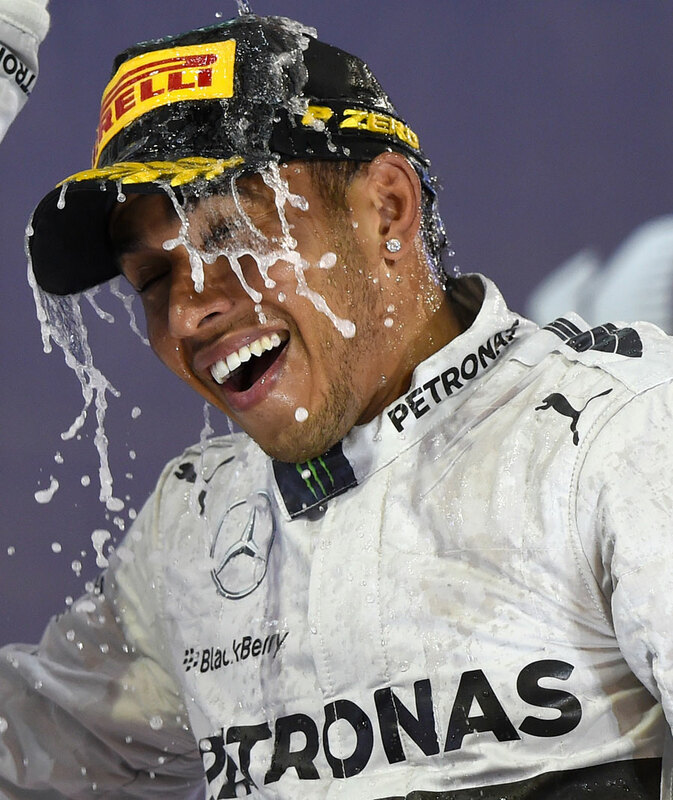 This is a lovely shot of Lewis on the podium while Nico pours the rosewater over his head. It reminds me of a photo of Ayrton Senna at Suzuka in 1988 taken by my brother Keith. It’s very similar and to me it just says emotion and celebration. 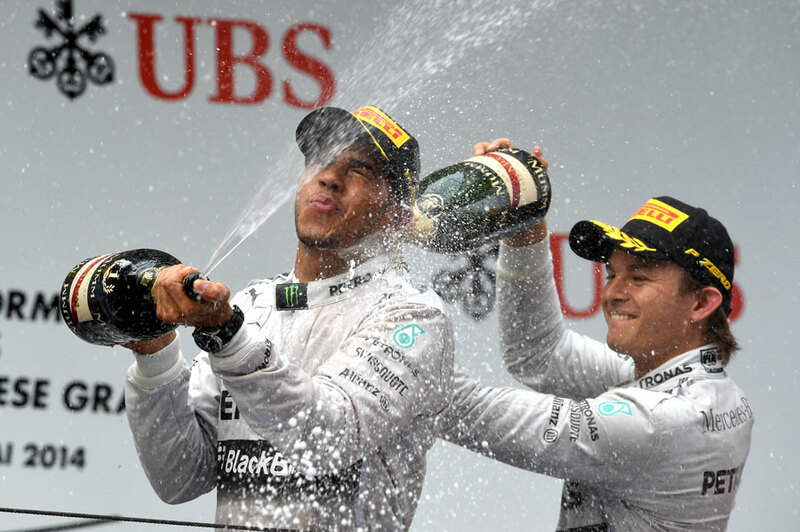 Of course it’s actual champagne in Japan rather than the rosewater in Bahrain! You could tell that when they tasted it on the podium and grimaced! Camera model: Nikon D4 Exposure time: 1/500s Aperture: F8 Flash compulsory, return light detected Focal length: 42 mm ISO speed: 800 Lens: 24-70mm zoom. 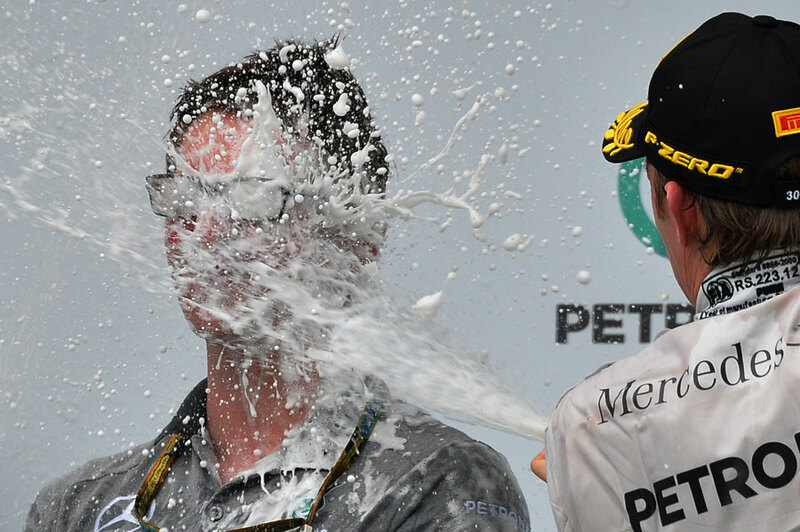 I really like this one of Nico Rosberg spraying Andy Shovlin. It’s a funny picture because it’s so much champagne and because he’s just standing there taking it. We saw those pictures a few years back when Adrian Newey tried to hide behind the trophy as he’s being sprayed, but Shovlin is stood there being absolutely blasted as if it’s nothing. If his mouth had been open he probably would have drowned in it. They sprayed the champagne so quickly that the guys who presented the trophy were still on the podium so frustratingly I’ve had to crop this as there was someone crossing in front of the frame of the original picture. Camera model: Nikon D4 Exposure time: 1/320 s Aperture: F9 Flash compulsory, return light detected ISO speed: 800 Lens: 24-70mm zoom. 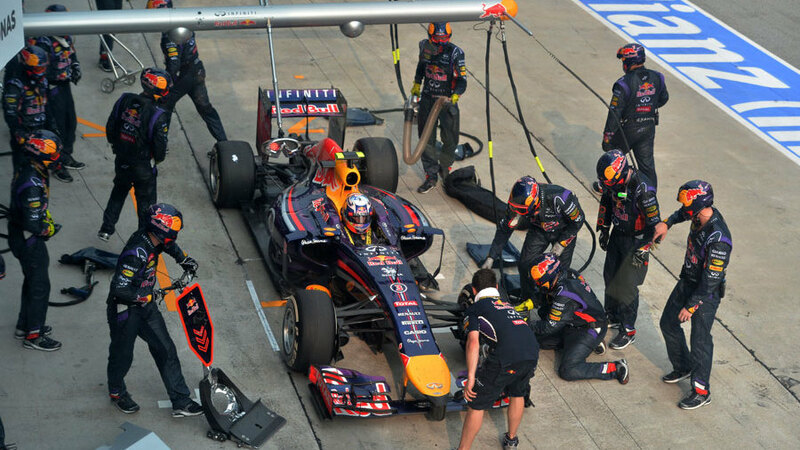 This is a remarkable picture as the guy without a helmet and wearing shorts is just there during a pit stop. I saw Daniel Ricciardo’s stop on the TV and then thought I need to get a picture of this. I ran straight across the media centre with my camera, ran down to Red Bull and shot away as they wheeled him back and then this guy is there. I knew the rules had changed with the helmet and they’re really tough on the teams and thought “he’s going to get a rollicking for that”. It’s quite a bizarre and funny picture overall because they you can see them all stood around wondering what the hell is going on, and of course it’s not what we expect from Red Bull. I just could not believe the guy was there. Camera model: Nikon D4 Exposure time: 1/1000 s Aperture: F5.6 No flash ISO speed: 800 Lens: 500mm telephoto. I guess this is quite a different shot for a Formula One fan, seeing an actor do the post-race interview. I thought Benedict Cumberbatch brought quite a different feel to the podium, instead of having a former driver or ex-team owner there. He speaks like an actor, too, he exudes and speaks with a lot of confidence which adds to the interviews. He’s got that sort of British gentleman approach to things with his suit jacket too so I think it worked really well. Maybe they shouldn’t do it every race. If you can make sure they don’t swear on the podium then it works to have famous people up there! He presented the trophy on the Porsche race as well and you could see throughout how much he was enjoying the whole occasion. Camera model: Nikon D4 Exposure time: 1/1000 s Flash compulsory, return light detected ISO speed: 250 Lens: 24-70mm. 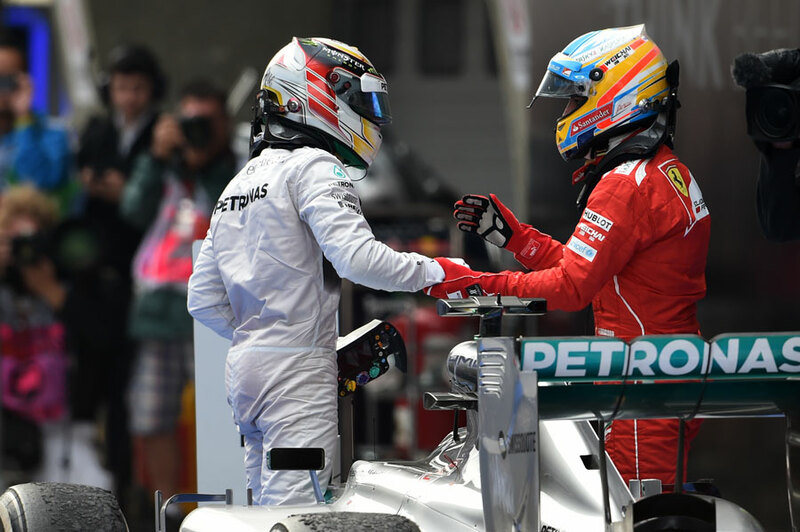 This is just a great shot as it’s Mercedes celebrating its first one-two as a team since Stirling Moss and Juan Manuel Fangio in 1955. You’ve also got that Petronas branding all over the picture too which they love so it’s a perfect picture for them. I’m not sure why Jock Clear is so central in all of that but he had champagne poured over his head and posed with Lewis and the trophy as well. One of the mechanics was central to it all as well which I thought was odd but maybe it was possibly a birthday or a special occasion. 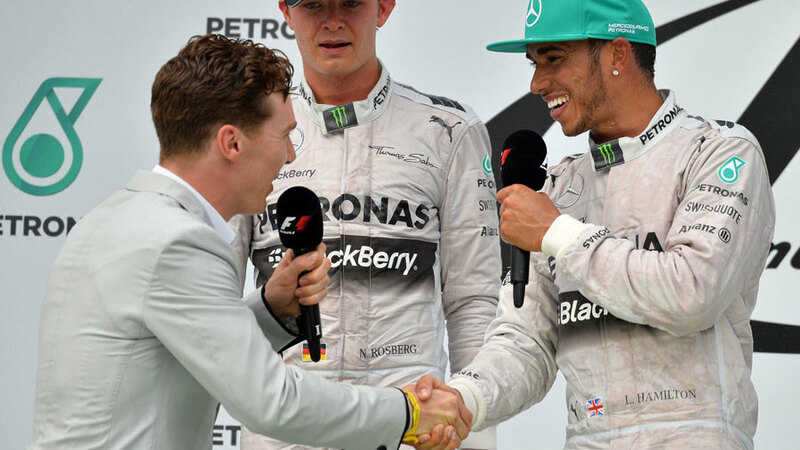 Rosberg was his usual exuberant self but I sense there’s a bit of tension brewing between the two drivers. Obviously one has more points than the other and everyone wants to win every race. Camera model: Nikon D4 Exposure time: 1/500 s Aperture: F5.6 No flash ISO speed: 400 Lens: 70-200mm lens. These guys were just completely legless. This was during the team celebration shot and I could hear them shouting as they were being cleared off the track. They were chanting for Kimi Raikkonen so I walked down the pit wall and shouted them over. They came over the first time but a security guard was not having any of it as they were trying to clear the track. I went about half way down and went again and I managed to get them to pose for a picture. They were quite a jolly bunch. 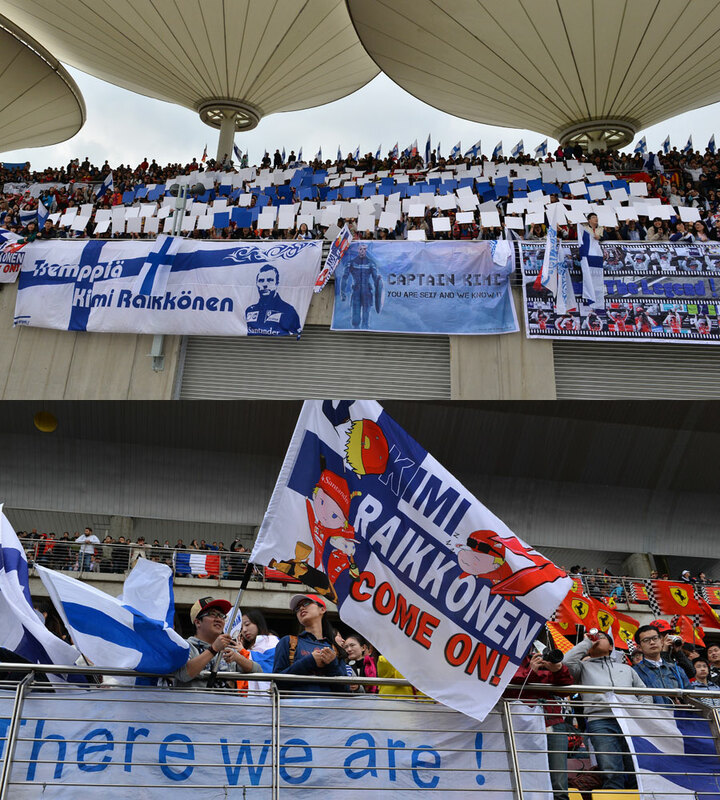 There’s a real mix of European fans in Malaysia but a lot of fans come over from Denmark, Sweden, Finland and so on and some local fans are dedicated to certain drivers. A lot of people make a hobby of watching F1 and why would you not? They had been drinking all day and all night, that day and the day before, and it was very funny to watch. Camera model: Nikon D4 Exposure time: 1/1000 s Aperture: F6.3 No flash ISO speed: 800 Lens: 500mm telephoto. This is a nice one from before the race. It’s something different and nice to see the girls dressed in something different from the traditional outfit. 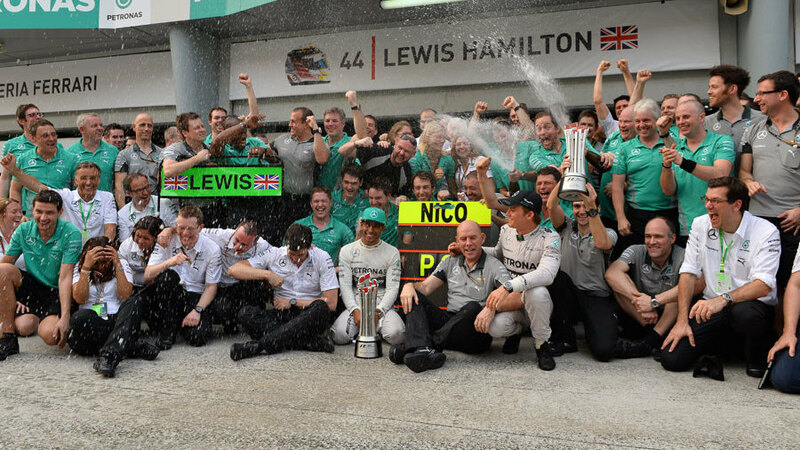 It’s obviously Petronas-inspired and Lewis and Nico were pushing that pretty hard in the post-race stuff as well so everyone’s a winner! Sometimes the girls can be quite miserable at that time of the race because it’s a long day in incredible temperatures but they were smiling and blowing kisses which is nice. It’s a tough day for them in that heat and in those outfits and we can relate as it’s a tough day for us as well. It’s great for pictures as well to see them smiling and generally enjoying the day.